The Federalist web site/e-mail newsletter, a Site of the Month winner back in November 1999, may well be one of the most influential online periodicals. It's subscriber list includes the who's who in the world of politics and reaches tens of thousands of conservative activists and readers each and every week. The Federalist's latest project is Patriot Petitions, "an opportunity to challenge anti-American activists in media, politics, academia and culture" via the time tested institution of petitioning. 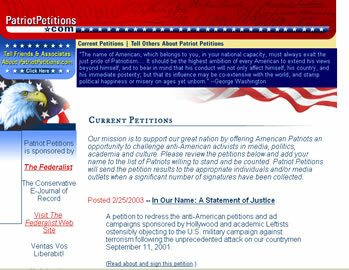 Not surprisingly, Patriot Petition's first project is a response to anti-American and anti-war on terror petitions that have been circulating since September 11, 2001. Incredibly, the web site managed to collect over 30 000 signatures in the first few days of its campaign. It's fashionable to decry petitions as a quaint 19th century holdover that does little practical good today. It's true that the value of a petition lies not in who signs it, but how much value the recipient places in it. That said, petitions are still a valuable tool that allow people to register their opinion in an easy manner and gives an indication to the recipient of the depth of feeling behind a campaign. Patriot Petitions promises to send clear signals to people over the coming years. Know of a site that you think should be spotlighted? Write and tell us! � 1996-2003, Enter Stage Right and/or its creators. All rights reserved.